Happy Teacher Appreciation Day! A couple years ago, I shared some easy DIY teacher appreciation week gifts so I am back to share some more! Teacher Appreciation Week is here but there is still time to put together the cutest DIY gifts. I found this idea on Pinterest from jenny collier but I thought I would do my own take on it. I picked up a couple orchids for each classroom and used supplies I already had at home for the card (card stock, stamps, and twine). We DONUT know what we would do without you! This adorable free printable is available from Happiness is Homemade. 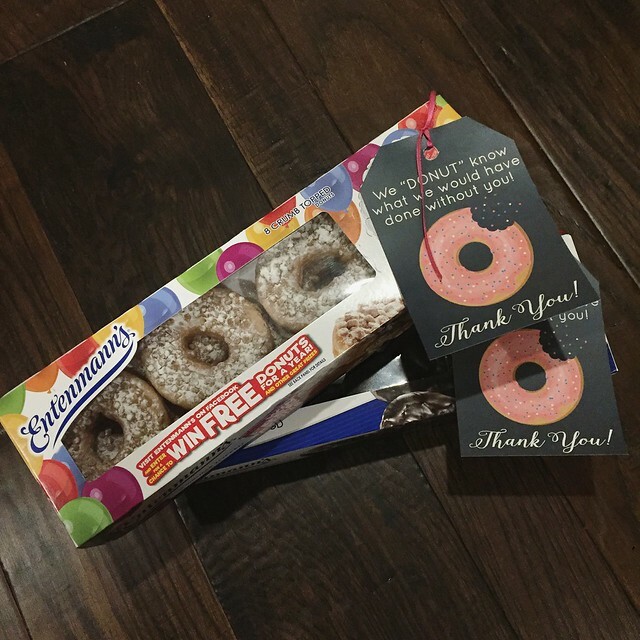 Print and deliver with some yummy donuts for a treat for your teacher. I love this idea because if there is more than one teacher, everyone can enjoy this one. Here is another adorable free printable from Life Anchored. 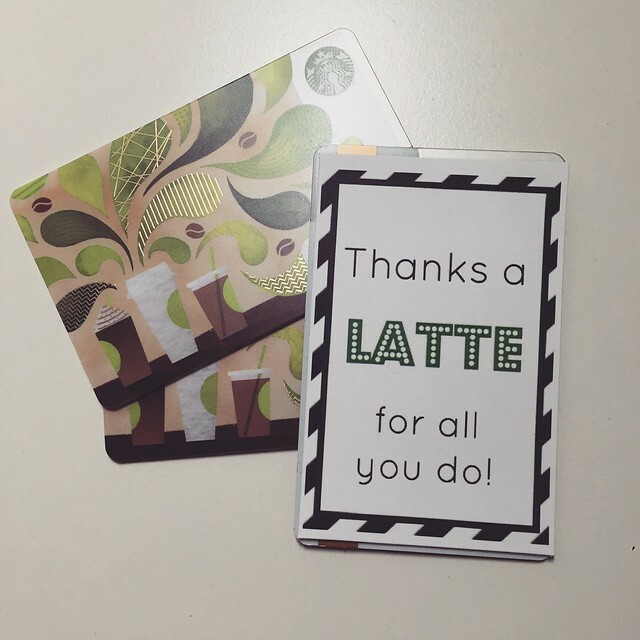 I attached if directly to a Starbucks gift card for all of the teachers, but I also love sticking the gift card into an empty Starbucks cup. Super cute. What are your favorite ways to show your teachers how much you appreciate them? I am finally here to share my first Pinterest Christmas project with you! 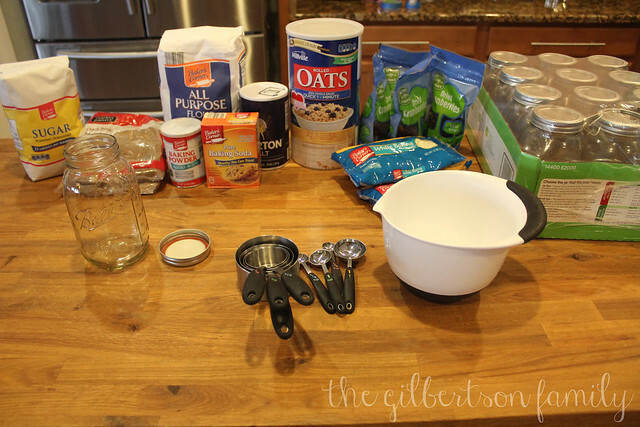 This year, I made (actually, I am in the process of making) cookies in a jar for the teachers at the kids’ school. I went with the Cranberry White Chocolate Oatmeal Cookie because I asked Greg and our friend Ryan what cookie they would prefer to receive as a gift and the answer was “oatmeal”. I figured the cranberry white chocolate makes it a little more festive since this is a Christmas gift. I found the recipe through Pinterest (obviously) from Thrify Jinxy. 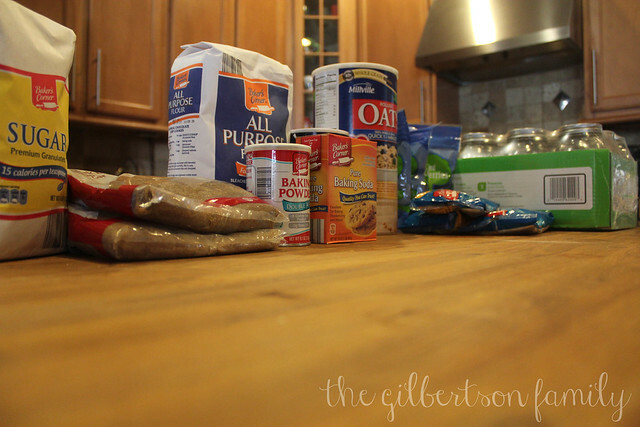 I got majority of my ingredients at Aldi (which is another blog post for another day) except for the brown sugar since they didn’t have any. The 32 ounce ball jars were purchased at Ace Hardware for $10 for a case of 12! Do not purchase these from your local craft store… they are way more expensive. Michael’s had them priced at $3 PER JAR! I do not own an 1/8 teaspoon measuring spoon, so I eyeballed the measurement using my 1/4 teaspoon measuring spoon. 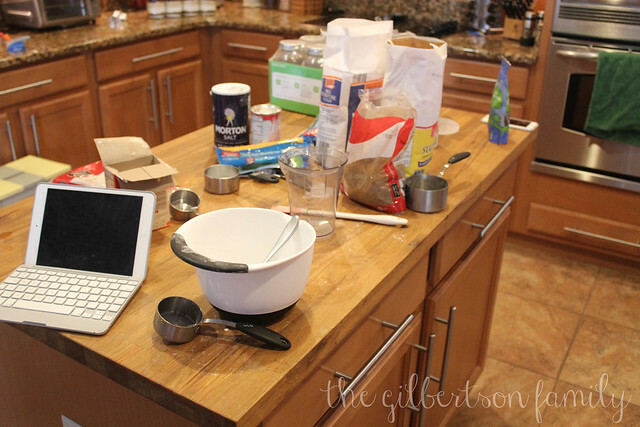 You will make a mess in the process and if you have little ones, they will want to help, which means they will want to eat all of your white chocolate chips. 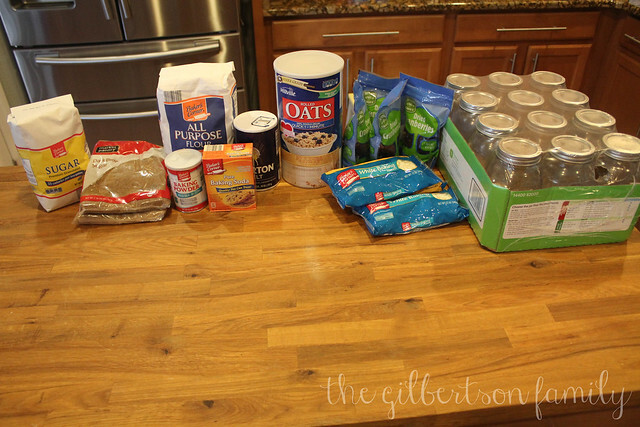 Once you start adding in the ingredients, you may think they aren’t all going to fit in the jar, but it really ends up fitting perfectly every single time. 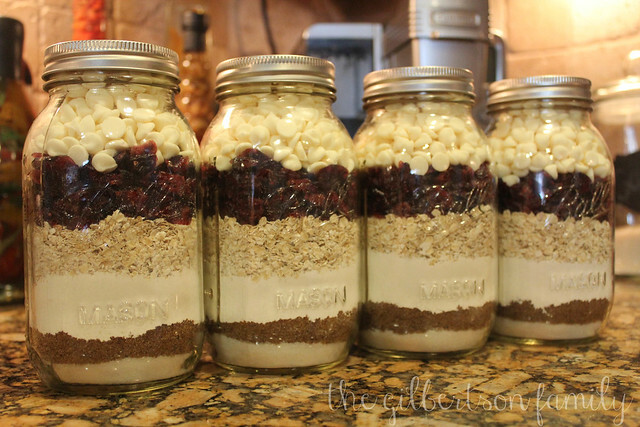 The layers of your jars though will not be perfect. I know, this was a hard one for me to swallow, but some of my jars looked better than others. Live with it! I really love how they turned out! I am planning to add a little ribbon with the instructions for baking tied on to them, but right now, I just like to admire my hard work. I definitely recommend these cookies in a jar if you are still thinking about giving some homemade gifts this year! Don’t forget to link up to the Pinterest Christmas 2015 linky party with your Christmas crafts the entire month of December. Click the link below to add your blog link! Also, don’t forget to check out what Misha is crafting over at Emerald City Diaries!